Columbia International University and Mashburn Construction celebrated a time-honored building tradition with a “Topping off Ceremony” of the $20 million William H. Jones Global Business & IT Center under construction at the CIU entrance on Monticello Road. 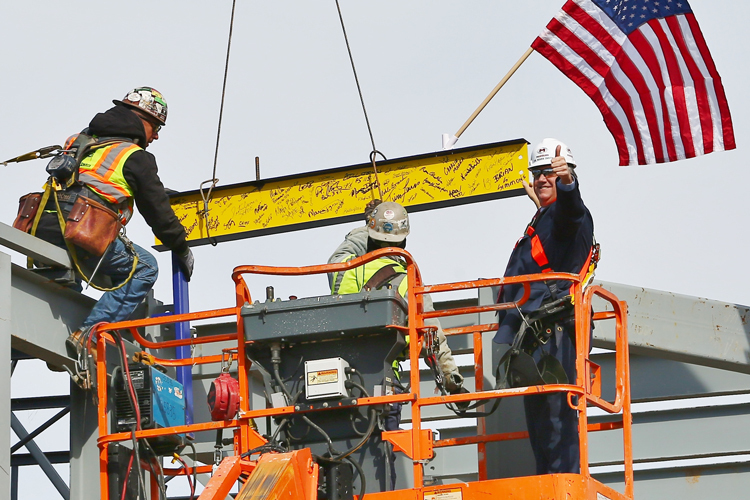 Officials of both companies, as well as the construction workers, cradled large Sharpies in their hands as each signed their name to a ceremonial metal beam that will “top off” the Business & IT Center. The Center is being designed to be a training ground for best business practices at home and abroad, for business as mission, and a hub for Monticello Road community business development. CIU President Dr. Mark Smith called it a “special day” for CIU and a “huge step forward” for the school as it looks to the future. All watched as President Smith rode a construction lift to secure the ceremonial beam in place. “I used to weld,” Smith laughed as he remembered how that was not his forte. Attached to the beam is a small tree and a United States flag, also traditions. It was announced that construction of the building is running a little ahead of schedule, with completion expected in August in time for the new school year. Interested in Business? Check out our Business program options here. Excitement is building on the CIU campus with a dramatic increase in enrollment. Information on enrollment is available here or call (800) 777-2227, ext. 5024.